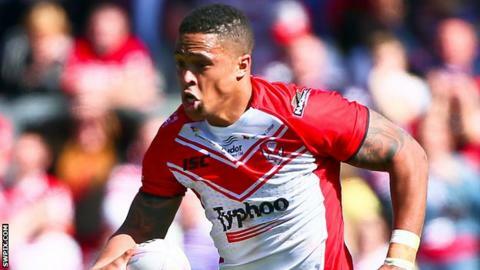 St Helens expect to be without Jordan Turner and Kyle Amor for significant periods after they were injured in Saturday's Challenge Cup loss at Leeds. Centre Turner, 25, played for more than half of the game with a broken foot, while 24-year-old prop Amor hurt his knee and left Headingley on crutches. Nathan Brown's side lost their fifth-round tie 32-12 to the Rhinos. It was a third consecutive defeat for Saints, who began the campaign with nine straight wins in all competitions. But losses to Wigan and Widnes over the Easter weekend have seen them drop to third in Super League, while their Challenge Cup exit will extend their wait to end a trophy drought that stretches back to 2008. Versatile half-back Lance Hohaia, a World Cup winner with New Zealand in 2008, was left out of the 17-man squad against Leeds, a selection that Brown defended ahead of Thursday's visit of London Broncos. "When you make some tough calls, whether you win the game or lose the game, it doesn't mean you got it right," Brown told BBC Radio Merseyside. "When you lose a game, it doesn't mean you got it wrong either. "We just thought that going with some extra bigger people against a big Leeds pack might have been a better option for our team on this occasion. Did we lose the game because that's the way we went? I'm not convinced that's why we didn't do so well. "We started the game poorly and were on the back foot. "Lance has been playing well and it's good to see Lance getting some credit because he's been given a hard time at times. To see that is a real positive for me."